Oh, food, how I love you…..let me count thy ways. Anyone else there with me? Food is sooooooo good!!!!!!!!!!!! I think many people who follow me on social media are always surprised when they learn how much I like foods that aren’t exactly healthy…..you know, donuts, tacos, pizza, basically anything with sugar. As an online health and wellness coach, most people think we live on kale and celery stalks, and trust me, that’s not the case. We just appreciate balance in our daily lifestyles, and sometimes that means eating something that isn’t a healthy choice. Last week this unhealthy choice came into my life in the form of fried chicken. Fried chicken isn’t something I crave often; however, back in January when I started my 80 Day journey following a timed nutrition program, it was the one food I started to miss the most. I have no clue why. I wrapped that program up and for some reason never got the chicken that I had thought about so often during those three months. On Tuesday Kyle had decided he was going to stop by a local Church’s Chicken and pick up their 2 piece special…..something he did often because he enjoyed their chicken. I told him to pick me one up as well. In typical Tuesday fashion, I went into the studio and taught my kickboxers a few classes, then returned home, excited to partake in the chicken. The 2 for $2 Tuesday special includes a leg and a breast, and Kyle always sticks it in our toaster oven for a few to give it some extra crispiness. I crushed the leg first (i have always been a drumstick person), then bit into the chicken breast. Immediately I felt like something didn’t taste right, but I took another bite to make sure. It tasted like the chicken wasn’t cooked thoroughly. To be certain, I peeled back the layer of fried skin to look at the meat, and that’s when I saw it: what I thought was a chicken brain. The Church’s that served me this is located at 1391 Wooster, Akron, Ohio. I started to freak out, and Kyle, still enjoying his chicken, thought I was being dramatic. Finally I shoved the box in his face so he could see up close what I was talking about. He was as appalled as I was and immediately whipped out his cell phone to start to figure out what the heck was in my chicken. After some googling (which included him measuring the special addition to my chicken), and me contacting a few of my veterinarian friends, it was confirmed that it wasn’t a brain (though it sure looked like one), but was instead a chicken lung that had not properly been removed. I was sick all night from the chicken, not because of my disgust of the lung being in it (though don’t let that fool you, I am still thoroughly disgusted now….which is why I had to share with you all), but because the chicken wasn’t properly cooked. Lucky for me I ended up being extremely sick for a full day after and struggled to get through my daily activities. The following morning I contacted Church’s corporate office to report the incident. Hooking your customers up with salmonella or food poisoning is never okay, and the lung being in the chicken breast was completely unacceptable. I spoke to a gentleman who barely even apologized for the bad experience, only giving me a reference number and assuring me someone would contact me regarding this incident. UPDATE: It is over a week later and still NO ONE has contacted me. I also went through the website, submitting photos of the chicken, and have not had anyone from the Church’s where the chicken was purchased contact me. Unacceptable. It’s bad enough to serve less than desirable food; it’s even worse to not deliver quality customer service after the fact. Another up close look at the nastiness of Church’s. I am urging all of you to stay far away from Church’s Chicken. I know fried chicken is so great and many of us love it, but this is not the chain to get it from. In fact, thanks to the disgusting experience I think it is safe to say I will never be eating fried chicken again. Thanks, Church’s. For those local to me, the Church’s Chicken you SHOULD NOT GO TO is the one located on 1391 Wooster, Akron, Ohio. Please let your friends know, especially those who frequent this establishment. If you are going to go to Church’s, I highly recommend you dissecting your chicken before eating it to avoid eating a surprise part of a chicken’s body. Another Monday is among us…..did you get your meal prep done so your week is a success??? That’s right….my usual Sunday routine did not happen today. Mark your calendars, because that’s rare! Since I will be out of town tomorrow and not returning until Tuesday night, I wanted to wait to do my meal prep until Wednesday, so my plan is a little off this week. My meal plan is always full of fresh meat and produce, and I didn’t want fresh items to sit around for two days for no reason. I’m ok with the change of plans….I know I will be making healthy choices while out of town, but I’m excited for the recipes I get to make when I get back home! This week is all about blending something old with something new! 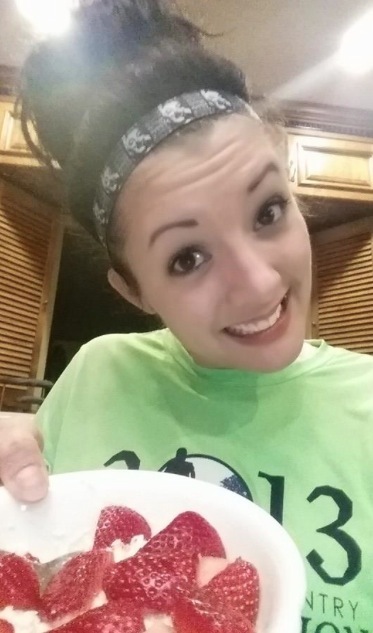 My snacks are usually always the same….I love having my Shakeology at night, and having Nice Cream for my morning snack is a great way to make sure I am getting my fruits in every day (anyone else struggle with this…or just me?). –Coconut Chicken! I love coconut anything, and when I stumbled across this baked chicken recipe I just had to try it. I’ll make sure to share the recipe once I can attest to whether or not it is as good as it looks! –Ahi Tuna! This week is all about new recipes…..and this marinated seared ahi tuna is another one. I’m making it as my main dinner this week, but I will be making fish tacos with it, too. And because I just love fall….I’m pairing the tuna with a maple cinnamon butternut squash recipe that is ah-mayyyyyyyy-zinngggggggg. –Fix Enchiladas! I haven’t made these since New Year’s Eve when I made them for my family. Mexican food is one of my true loves, so you will typically see at least one Mexican recipe on my meal plan! Other things I am excited for this week???? The sneak peek of Core de Force tomorrow! Anyone else trying this with me by using On Demand?????? Bring it, Joel and Jericho! I can’t wait to change up my training. Super Saturday is a huge event that takes place quarterly for coaches and fitness lovers who get together, work out, learn about some exciting new updates/programs/etc, and network! I am honored to serve on the Market Council for the Cleveland Market, as well as being on the Star Diamond panel to answer your questions. There is a small fee for coaches, but the event is free for guests! Come join us! We will be sharing a big celebrity announcement for our January event, and everyone in attendance gets first dibs on tickets for it! Get your Super Saturday tickets here! I hope your week is full of Sparkle! Sea-duced in a major way. I have been WAITING for this trip for what seems like forever. We had registered back in January of 2015, and at that time this trip seemed like a lifetime away…..that’s a long time to wait! Since Kyle and I canceled our honeymoon (thanks Hurricane Joaquin), we were more than ready for some tropical fun. I had scheduled an early Saturday morning flight so we could go right from the airport to the port in Fort Lauderdale, which meant we had to be at the airport around 3:30 Saturday morning. Most people who know me know that I am very much a nocturnal person….I usually go to bed around 4am and get up about 11am, so I wasn’t really worried about the early departure time. However, I failed to think about the lack of sleep I would have the day prior. We live very close to the Cleveland airport but had found much cheaper flights out of Pittsburgh, which is pretty close to my mother’s, so we had driven down to her house Friday so she and my aunt could drop us off. I tried to get a few hours of sleep by lying down at 9pm, but thanks to my weird schedule it was impossible, so no sleep for me! Wide awake for an early morning departure! We arrived in Fort Lauderdale and to the port with no issues…or so we thought. After checking in and getting our Sea Passes, we were escorted to a strange holding cell area on the second floor of the port. Being new to cruises, Kyle and I had no idea what was going on and thought this was just a temporary thing. After about an hour of waiting we found out that the hold up for boarding was actually a disgruntled crew member who was trying to commit suicide by jumping from the boat (you can read all about that here). Eventually police officials were able to get the man down safely and we were able to board…..when it was all said and done we had been waiting in the holding cell area for about three hours. The boat Beachbody chartered for us was through Royal Caribbean and was called The Oasis of the Seas, one of the largest boats out there. I had no clue what to expect when I walked on board but quickly realized that everything I thought was wrong. There was a Michael Kors store right in front of me(yes, I did some damage there), a Starbucks in eyesight, a pizza parlor cranking out pizzas for all of the hungry people coming aboard, and a bar that actually moved up and down in the middle of the ship…..and that was only on the one floor! First stop….a Starbucks Cafe Americano! Our room was a Superior Ocean View Stateroom with a balcony, and I have to admit….it was much more spacious than I had imagined. We had a comfortable Queen Size bed, sofa, vanity area (my makeup and I were happy), large closet, and a decent sized bathroom. My biggest concern about the room prior to arriving was that my 6’6″ husband would be very uncomfortable in it. Fortunately, he had plenty of space, especially in the shower, and had no complaints. Having a balcony was great, too….I loved being able to see the water…and I think a porthole room may have made me feel a bit claustrophobic. Our boat left the port about 5pm that Saturday, but we missed the Sail Away party….we had already met up with some of our friends and were busy exploring the ship! At this point I was pretty much driving the struggle bus….I still hadn’t slept at all, so I had been up since 11am Friday morning. Thank heavens for coffee…..as usual. We didn’t stay up too late that night….I had gotten really sick from some food at the one buffet and was feeling awful. Since we were arriving in the Bahamas early the next morning I wanted to make sure that I was feeling better and well rested. Waking up in the Bahamas was such a beautiful sight. We had ordered room service for breakfast and enjoyed a great meal on the balcony overlooking Nassau before getting ready to explore. We had the option for some excursions but had opted out of doing any because we weren’t sure a) what we wanted to do (so many options) and b) how the whole process worked. After breakfast we showered and decided to walk around the port and the city a bit. After some shopping we hit up the pool to catch a little sun before formal night and the glow party. Our ship had 5 pools on it and so many hot tubs I lost count, and since most of the ship was out doing an excursion or two, it wasn’t crowded. Formal night was so much fun! I love getting dressed up, and it was fun seeing everyone else all dolled up! I got lots of messages about the dress I wore….it was an adorable find from the clearance rack at David’s Bridal and very Kate-tastic! We spent most nights having dinner with my success squad and their husbands and trying different things. I love that we could order whatever and however much we wanted, so we found ourselves ordering way more than we typically would. For a big eater like Kyle, this worked out well for us…..he eats so much! Something I fell in love with over the trip: cold soup. This banana soup was Ah-Mazzzzzz-ing! I felt like I could eat it, drink it, pour it over ice cream, mix it with Shakeo, etc. I am determined to remake it here at home. In addition to the banana soup I had mango soup, peach soup, and pineapple lychee soup over the course of the trip. After a very filling meal we all changed to head to the Glow party where we were encouraged to come wearing white. Apparently there would be glowsticks and who knows what else. After changing we found out that the party was changed to later in the trip and instead there would be a dance party at the front of the boat. Five minutes at the party, and I tapped out. It reminded me 100% of a sweaty rave that I would’ve loved during my drinking days. No thanks. Our next stop was Falmouth, Jamaica, so we spent Day 3 at sea. We opted for breakfast in our room once again before heading to the pool with our pals. I was stoked to get a non alcoholic pina colada in a pineapple….it was so good! We spent most of the day on the top deck catching rays before catching a nap and a run. The ship had a running track wrapped around the entire 5th floor deck which hooked me up with beautiful views and a peaceful breeze as I ran. I’m proud to say that I ran a 5k in the middle of the ocean! Later in the evening all of the Dynasty United coaches on the ship met in our leader Brittany’s suite to chat. After all, our business was the reason every one of us was on this cruise. For those of you who don’t know much about coaching, it’s all about helping people. Helping them make smarter nutrition choices, helping them find the right fitness programs to reach their goals, helping them find confidence and purpose…..it is a business that has changed my entire life, and I am so proud every day to be a part of it. Being on a cruise that Beachbody completely paid for because I did my job was great and all, but getting to spend quality time with others who believe in the same vision and goals as me: priceless. Our team is made up of the most amazing men and women, so getting to hang with a few of them was so much fun. We laughed, we cried, and we just talked, mostly about how much this business has changed our lives and our family’s lives. It has allowed so many of us to retire from boring soul-sucking corporate jobs, it has allowed us to pay off debts, it’s given us confidence and the ability to overcome things like depression, post partum issues, and body issues, replacing those things with hope, purpose, and happiness. We all come from different backgrounds. Some of us are in college, others are grandparents. Some have Doctorate degrees while others have GEDs. We have lots of parents who dreamed of being at home with their children and being present for all of the big moments in their lives, and we have people who just wanted a career that allowed them to work when they want and how they want. We have extreme introverts and extreme extroverts. Some of us went through major health transformations while others have always been physically fit. It doesn’t matter the background; the one thing we all have in common is simple. We just want to help as many people as possible and work to end the trend of obesity. I love that there isn’t a coaching stereotype, and I love surrounding myself with people who build each other up and share in the success instead of competing or tearing each other down. Iron sharpens Iron. After our Dynasty United hangout we hit up the Disco party. Some people really took advantage of the opportunity to dress up, and part of me wished we had a little more. Truth is, I knew I would be super close to the weight limit on my luggage and felt that eliminating a wig and a huge 70’s costume was probably smart. Kyle and I went as early 70’s hippies, so we were comfortable and rocking the tie dye. This hippie chugs water #likeaboss. I fell head over heels in love on Day 4…..and I’m angry it took me a few days to discover the objection of my affection. Look at this french toast! I don’t know what it was made of….angel wings, cherubs, rainbows…..and I didn’t care. It was incredible. I continued this relationship the rest of the trip and am sad it came to an end. It reminded me of Disney World’s Tonga Toast! So good! After I had my date with the French, it was time for Jamaica, Mon! I absolutely could not wait to get to Jamaica, but as excited as I was, I had trepidation as well. I knew that tourists were the livelihood of Jamaica and that locals were known to approach them, sometimes getting really aggressive. Since I was with Kyle and two other couples, I felt safe enough to venture out. We hit the market and then had one of the local (who I called a Stage Five Clinger because he truthfully was) walk us to a little place in an alley right next to Usain Bolt’s church. He claimed it had the best Jamaican Jerk Chicken in the country, and he did not disappoint. It was so delicious! I was happy we trusted his recommendation. After we got back on the boat the guys decided they wanted to do the zipline on the 15th floor. I really really really wanted to try it, but my fear of heights got the best of me. Everyone else did it but me, and that’s okay. Instead I gave the rock wall a try. It was super high and overlooking the Boardwalk, so again, the heights terrified me, but I tried. My goal was to get higher than three stones, which I did…..and I actually liked it! The face of a scaredy cat. That evening was all you can eat lobster night, and our table took full advantage. Seventeen lobsters were owned by us……on top of prime rib and a whole gaggle of other foods……which led to our gang going to switch into comfier elastic waist clothing. Kyle was very happy about it….it was his second night with lobster. The night before he had gotten one and was very satisfied…I think he loved that it matched his lobster shirt. After dinner we went to a show on the boat that was great, eventually ending up with coffee on the top deck. It was a fantastic night. Our final day on the water. About 99.9% of people on the boat hit the pool, but not I. Kyle got caught up on some sleep while I enjoyed the company of friends (and coffee) and got caught up on some reading. I very much believe in the power of personal development, so being able to read on our balcony listening to the ocean ways was good for my soul. We also made the decision to book our next cruise….next year we will visit Cozumel, Puerto Vallarta, and the Cayman Islands. I guess you can say we were sea-duced?!?!?! After yet another delicious dinner with friends, I met up with a new friend who I had been waiting to see all week. My man Tony Horton. I’m starting his new program, 22 Minute Hardcorps Monday, so this was the boost of excitement I needed. It as a great way to end the trip. Our plane left early from Fort Lauderdale, so we took advantage of the early departure to get off the boat and through customs quickly. I was impressed how easy and well organized the process was. After a few hours and a short flight we were back at my mom’s for the night, and we both were exhausted. Early to bed for us! I can’t begin to express what this trip meant to me and did for me. Did I have an absolute blast with my husband and my friends? Absolutely. I am so glad I got to spend time with them and combine business with pleasure. Did it refuel my passion for the business? Absolutely. I want every single person I know to be able to have this lifestyle, these friendships, and this feeling of complete purpose. But this trip did so much more for me than what I’ve mentioned. It really helped me get my mind in a better place. Prior to going on the trip I had reservations, mostly because I felt guilty. One thing I have struggled with so much since I lost my dad is finding joy in things or looking forward to things….I think it is common. It’s just hard to find happiness when you feel like you have a little rain cloud following you around reminding you that something is missing from your life. This trip allowed me to laugh,it allowed me to feel alive again, and it helped me to surround myself my lots of people who love and support me. I had so many good talks with my friends about the situation, and it was nice to talk about how I was doing openly with them. I hadn’t seen many of them since everything happened….their hugs and kind words were very comforting. Lisa, Julie, Payton, Jess….you all especially….thank you for taking time to remind me that this business is more like a sisterhood and that you always have my back. I’m already looking forward to our next trip to Nashville in July and Punta Cana next year. Who wouldn’t want to go on all of these fun trips with their families and closest pals???!!!! I just need to figure out a way to bring Murphy with me…. If you want to know more about this business or these trips, or if you are someone who is reading this and just needs some support and encouragement to get healthier, lose weight, or build confidence, let’s talk. I have a three day sneak peek going on next week on Facebook, and I’d love to have you be a part of it. I also have upcoming support groups for my challengers and can create a one on one support system for you if that’s more your thing. Just cruise over to The Sparkle Fitness Babe, like the page, and shoot me a message! You can also contact me through this blog! Going to bed tonight with a very grateful heart. Grateful for finding a career that combines my passion with my purpose. Grateful for the opportunity to travel the world. Grateful for my husband, family, and friends for being the rocks in my life. Grateful for the guardian angel who I know is with me every second every day. Grateful for the experiences that have helped me grow. Grateful to be living a life that I know makes my dad proud. I hope you are going to bed grateful, too. -I like to eat healthy. 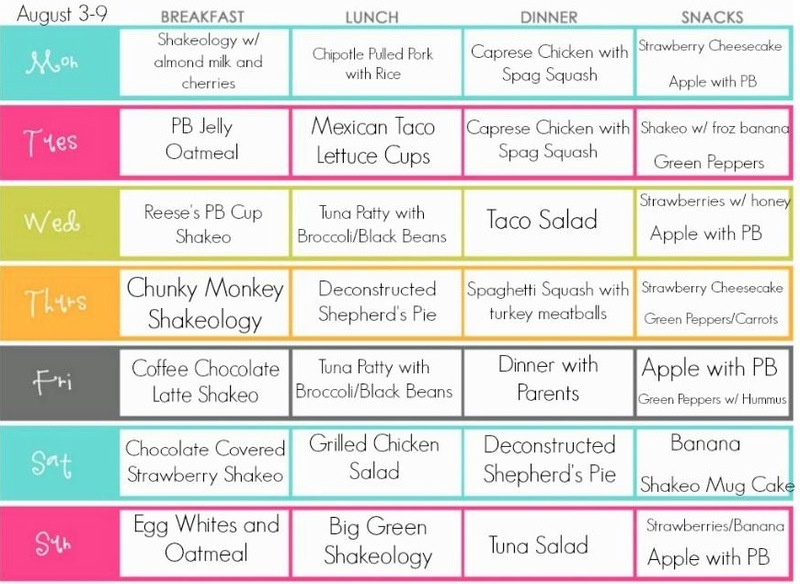 -I like to meal plan. Don’t think eating healthy is boring. I assure you, in my world, it’s not. 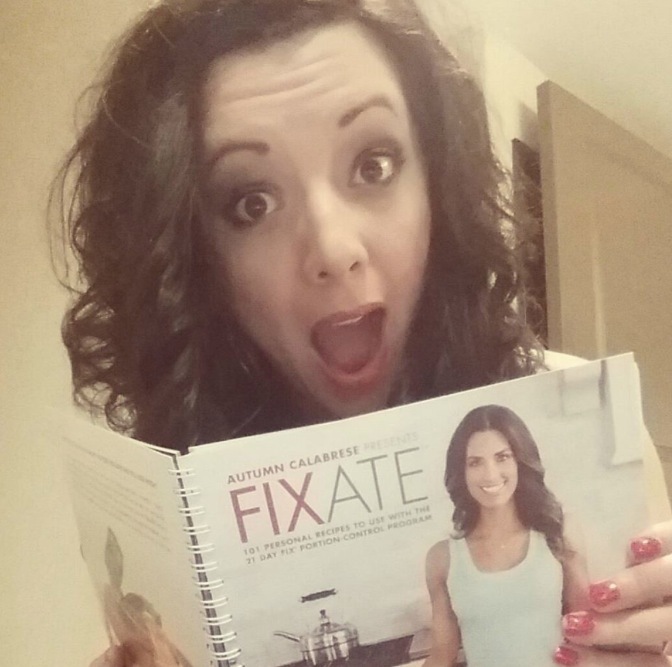 A few weeks ago I, like a million or so others, purchased the newly released Fixate cookbook, a cookbook created by Fix created Autumn Calabrese that shares 101 recipes. 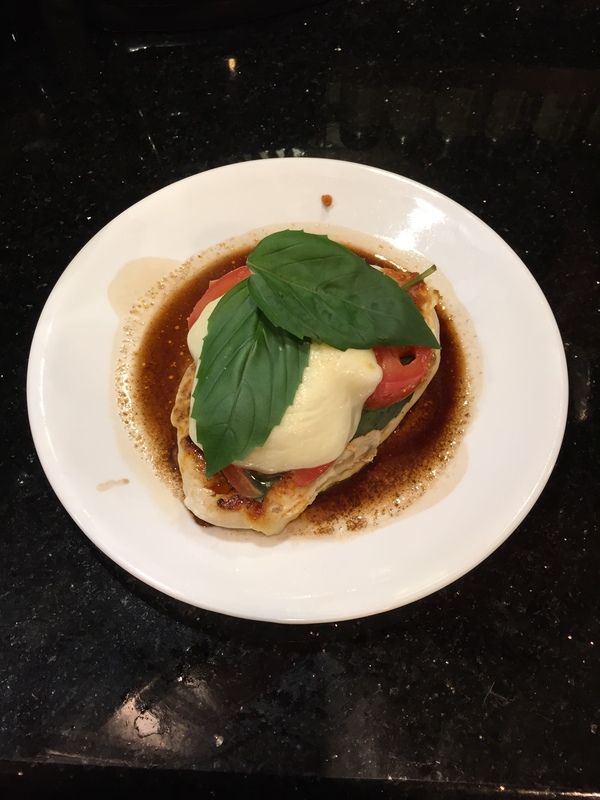 This week I made a few of the recipes and have to share with you one of my favorites to date….ladies and gentleman, let’s talk Caprese Chicken. 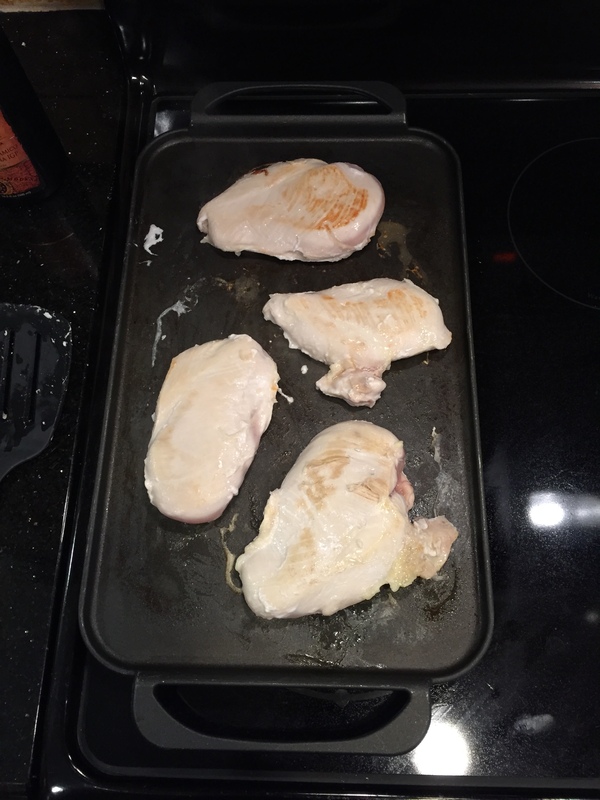 I prepared my chicken on a stovetop griddle….it is just easier, plus it allowed me to prepare everything else to save me some time. You could use a grill or even bake it if you prefer. Tip: I always opt for a coconut oil cooking spray for a healthier prep option. Here’s a little secret…I prefer Roma tomatoes aka maters over those big guys….not sure why, but find a mater you like and use that. Cut the mater up into slices, and cut the fresh mozzarella up, too! Once your chicken is completely cooked, top chicken (while on your grill/griddler/whatever) with a spoonful of pesto sauce, a slice of tomato, some fresh basil leaves, and a slice of mozzarella. Cover and cook at a reduced setting for a few minutes until the maters are soft and the cheese is melted. Then plate! Here’s how I plate: a spoonful of pesto on the plate, a splash of balsamic vinegar, the heavenly chicken breast, then some fresh basil on top. Doesn’t it look fab? I like serving it with spaghetti squash. Seriously, so easy and delicious. My fix friends, this is one red, 1/2 green, one blue, and one teaspoon. Another item on my meal plan that always seems to catch people’s attention is cheesecake. Yes, I have found a way to eat cheesecake on a healthy eating plan. Best part? Super simple! Mix up everything (minus the berries), then top with them. You could also use peaches or cherries, whatever you want. I usually mix it up in my red container (that’s what the ricotta is) to save on a dish and keep me on track. There you go, folks….a healthy dinner and dessert/snack idea to add to your meal plan. I like food. I like food a lot. Know what else I like? Sharing these healthy and delicious recipes with you so you can still have an exciting and amazing meal without feeling bored or disappointed. I think many people avoid eating healthy because they think all you eat is veggies and water……not the case at all, my friends. Those of you who haven’t purchased this yet, get it…..especially all of my fixers! Life is too short to eat boring. Enjoy!